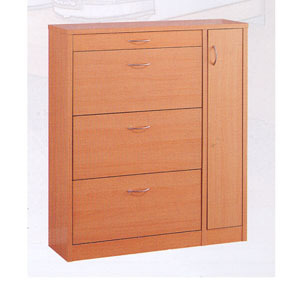 Features 3 Doors For Shoe Storage, One Drawer And Umbrella Storage. Colors can be mixed and matched or Solid Color as you like. Please see color chart for available colors. Strong Construction. Made of Melamine. This Shoe Cabine Is Also Available In Custom Size. If You Would Like A Particular Size, Please Indicate The Size In The Shipping Comments Box Or Contact Us Via Email Or Telephone. This Wardrobe Is Shipped Fully Assembled. Size: 47 In.(W). x 14 In.(D). x 48 In. (H).